Waste-to-energy projects figured in the election manifesto of the Bharatiya Janata Party during the recent civic polls in Delhi. BJP hoardings across the city declared that “the citizens will not be charged to generate power”. It seems the Municipal Corporation of Delhi (MCD) is obsessed with the idea of generating energy from garbage. Despite ample evidence that the technology is a failure and people’s oppositions to the projects, three waste-to-energy projects are under way in the capital city. The Okhla plant has been functioning on a trial basis since January, despite a public interest petition against it in the Delhi High Court, which is being heard since 2009. Construction work on another plant in thickly populated Ghazipur is in full swing. MCD plans to begin work on the third one in Narela-Bawana shortly. This is despite the fact that the country’s first waste-to-energy plant was set up in Delhi’s Timarpur area in 1984, and was rendered defunct within 15 days of its functioning. Incinerating waste to generate electricity not only releases toxins, such plants are unviable as the country’s municipal waste has a low calorific value. As per the Manual on Municipal Solid Waste Management of the Union urban development ministry, 44 to 53 per cent of the waste in India comprises materials that do not burn, construction debris for instance. 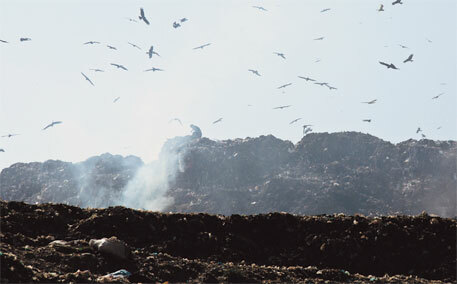 Incineration of such waste produces toxic ash that requires special landfills for disposal (see ‘Unfit to burn’, Down To Earth, March 1-15, 2007). Together, the three plants aim to incinerate some 8,000 tonnes of municipal waste the city generates daily and produce 62.2 MW of electricity; Delhi consumes around 4,800 MW of electricity every day. “It’s like killing two birds with one stone. We will get a clean city and additional power,” says a BJP spokesperson, explaining why the party supports the technology. Residents of Ghazipur say the plants will bring more trouble than benefit. A few residents from Kabadi Basti in Ghazipur on April 7 cornered BJP candidates over the waste-to-energy plant during their campaign to the colony. “We let them go only after they promised to look into the matter and stop the plant once voted to power,” says Varun, a Basti resident. Kabadi Basti is one of the six slums that lie within a kilometre of the plant. The plant also faces a Delhi Development Authority (DDA) colony and shares its walls with the city’s largest butcher house on one side and a veterinary hospital on the other. A cluster of dairy farms is located barely 15 metres from the plant. “The area is already contaminated with waste like decomposed skin, fur, flesh and blood released by the slaughterhouse. The incineration plant, releasing more toxic pollutants like dioxins, furans and heavy metals will lead to further contamination,” says Shashi Bhushan. He works with ragpickers and heads non-profit All India Kabadi Mazdoor Mahasangh. Dioxins, furans and heavy metals are known to cause cancer, birth defects, hormonal disorders, respiratory ailments and skin infections. “The toxins might also find their way into the cattle milk,” says C B R Nair, a resident of the DDA colony. On March 24, residents from the DDA colony and slums organised a citizens’ hearing near the plant. “But the police intimidated people and ensured a low attendance,” alleges Sant Ram, president of the residents welfare association of the DDA colony. The residents claim no consultation has been done for the plant. An analysis of the rapid environmental impact assessment (EIA) report of the project by Delhi-based NGO Hazards Centre shows the plant obtained clearance based on faulty claims (see ‘Ghazipur plant’s faulty EIA report’). 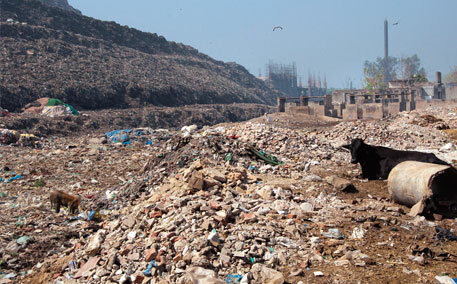 In November last year, the DDA residents had approached the Delhi High Court for a stay on the waste-to-energy plant. The court declined to stay the project, but will hear the case on April 24. P K Khandwal, superintendent engineer of MCD, says there has been no opposition to the Ghazipur plant. He adds that the Okhla plant has already treated 800,000 tonnes of waste and generates 8-10 MW a day. Project report of the Okhla plant states the plant would generate 16 MW. Delhi is not the only city where waste-to-energy plants are being built. Earlier this year, Bhagalpur municipality in Bihar received half a dozen proposals from private companies to set up a waste-to-energy plant. Last year, Jindal set up a similar plant in Jalandhar amid stiff opposition by residents. The Bengaluru municipality is also setting up a waste-to-energy plant. UNFCCC recognition of waste incineration to generate power is a double standard, says Dharmesh Shah of the Global Alliance for Incinerator Alternatives. In the garb of renewable energy, UNFCCC has given the dirty technology legitimacy. Several international organisations are fighting against this, he adds. Despite MNRE and CDM grants, tariff of electricity generated by a waste-to-energy plant is over twice that of the power generated by a thermal plant. For instance, the Ghazipur plant claims its power tariff would reduce from Rs 6.64 to Rs 6.15 a unit following MNRE aid. Taking the CDM grant (assuming the value of 1 CER is 15 euros) into account, the tariff would come down to Rs 5.44, way above the conventional tariff of Rs 2.15. It is very sad to come across such ignorance in the political and local-body leadership. This piece of information is even more disheartening as it shows us that the stuff they(politicians) are made up of, does not leave much to be desired even though they have been chosen to work in the country's capital. I would like to help throw some light on a clean and green alternative waste to energy conversion technology that is available and very much in use in our country. It is called Plasma Gassification and this technology has proven to form no furans, dioxins or tars. I am working for a company (SMS Envocare Pvt. Ltd.) that is the leading owner and operator of Plasma gassification plants in various cities in India. Please spread the word and help our politicians make a sensible and non-destructive decision. They need to realise that even they are going to be one of the victims who get affected by carcinogens or a thousand other harmful substances formed due to the improper conventional incineration method. This is not an advertisement for the company I work for, but a sincere effort to share some helpful information to be part of the solution to this problem. visit www.smsl.co.in for more information.